MESSE BASEL, SWITZERLAND, MARCH 22, 2018 -Today, Casio G-SHOCK announces the latest color additions to the popular women’s S Series line at Baselworld. 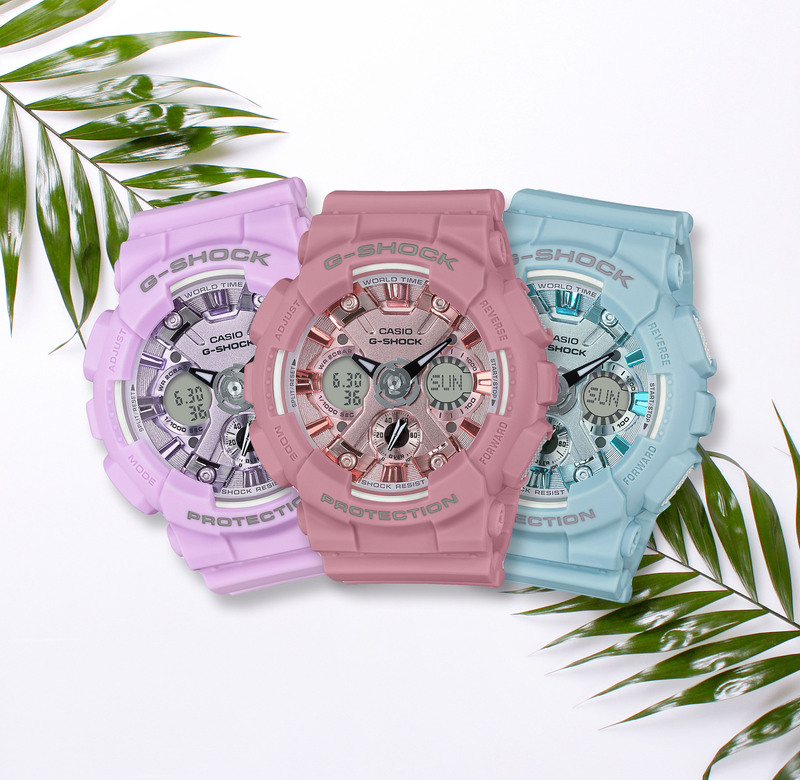 Featuring new pastel colorways of blue (GMAS120DP-2A), pink (GMAS120DP-4A) and purple (GMAS120DP-6A), all three models will be on display from March 22-24 at the Casio booth, located in Hall 1.1 B67, B71. Inspired by the light shades found in this year’s collection of popular women’s active-wear, the newest S Series timepieces feature complementary hues that pair perfectly with any casual summer wardrobe. Each model also comes equipped with standard technology of 200M water resistance and shock resistance, as well as magnetic resistance, an auto LED light, world time display (in 48 cities + UTC), four daily alarms and one snooze button, a 1/100th second stopwatch with speed indicator and countdown timer, and 12/24-hour format – all in a 45.9mm case. The GMAS120DP-2A, GMAS120DP-4A, and GMAS120DP-6A will retail for $130 and will be available for purchase beginning July 2018 at G-SHOCK retailers,including select Macy’s, www.gshock.com, and the G-SHOCK Soho Store..
CASIO’s shock-resistant G-SHOCK watch is synonymous with toughness, born from the developer Mr. Ibe’s dream of ‘creating a watch that never breaks’. Over 200 handmade samples were created and tested to destruction until finally in 1983 the first, now iconic G-SHOCK hit the streets of Japan and began to establish itself as ‘the toughest watch of all time’. Each watch encompasses the 7 elements; electric shock resistance, gravity resistance, low temperature resistance, vibration resistance, water resistance, shock resistance and toughness. The watch is packed with Casio innovations and technologies to prevent it from suffering direct shock; this includes internal components protected with urethane and suspended timekeeping modules inside the watch structure. Since its launch, G-SHOCK has continued to evolve, continuing to support on Mr. Ibe’s mantra “never, never give up." www.gshock.com.